Black tip reef sharks (Carcharhinus melanopterus) are very infrequently seen on Pom Pom Island off Semporna. Individuals are occasionally seen on very deep dives in the early morning at the N tip. One juvenile was seen in the shallows in Oct 2012. The fishermen caught it!!! We now employ those fishermen and with our education programme in their village, we may manage to protect the next shark that comes to the island. Sipadan the world famous dive destination (fully protected) is only 70km away and they have a few Black tip reef sharks; about 1 seen each month. 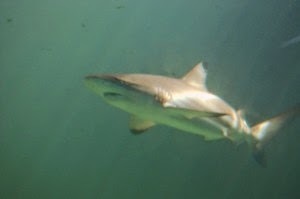 Sipadan does have lots of White tip reef sharks and small numbers of Grey reef sharks which are seen every day. Pom Pom island doesn't have the same shark population as Sipadan but we know there are lots of fish on the deep wall below 50m and it is possible there are sharks down there that we don't see during the day. We do know where there are a few baby blacktips in the Semporna region but for obvious reasons we are not disclosing the location.